vet came today and he is really pleased with her leg, she can now go out in the paddock with her friends all day, with bandage and cast on. i am so pleased, she is such a good girl. Aww so pleased shes making progress Paula They do like to worry us don't they!? yes they do!! i had my welshie colic last sunday too, i mean i know that i fancy my vet but come on. this is getting out of hand!! Amazing how quickly they heal, when looked after properly! Shame vet's don't give us a discount if we fancy them. Khallie is a credit to your care of her, Paula, she is a very lucky filly yo have you as her owner. I am so glad that she is healing well. We have both been through a bad time horsewise lately but maybe we have turned the corner now! That looks great now---well done you. It's the nursing that counts. Your vet doesn't happen to be Scott Milnes does it?!!! Thank Goodness for the good news. Wishing her a very speedy trouble free recovery. No hes called Nelson Rowe, Khally absolutely loved it going out this morning, so excited a huge buck then grass, She is a real star, thanks Barbara for allowing me to have her,she is a real sweetheart and a stunning looking filly, even if i do say so myself. Great News, Sooooooo pleased to see your brave little lady is on the mend and thoroughly enjoyed her fun in the paddock. That looks horrible, what on earth did she do? Looks like it's healing very well, which is great news. 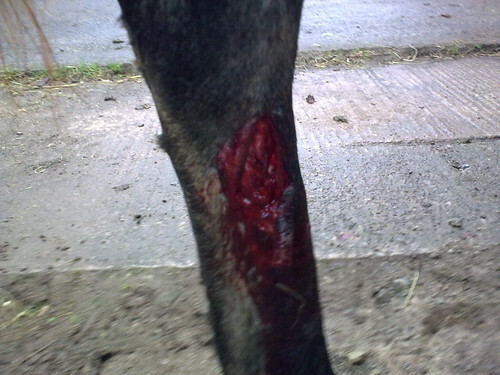 she put her leg through sheep fencing, snapped post and rail fence at the bottom and lucky she didnt cut vein! Oh Paula how awful ! But at least she looks tons better now! Glad she's on the mend! I couldn't imagine a better home for her, Paula, she is a lucky girl to be with you. I am so glad she is healing well. My god. Poor little girl. I hate sheep netting. 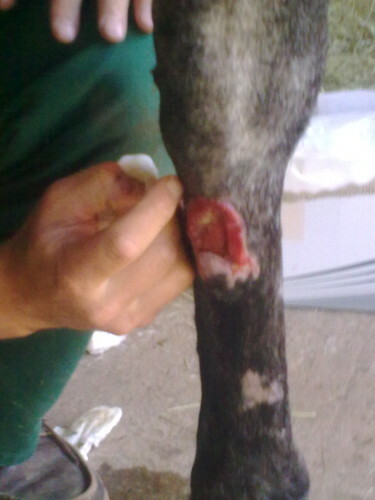 My OH's had a mare who put her leg though sheep netting and tore half her heal off. Luckly when Brambles our cob did it many years ago, she just stood there and waited for someone to come and rescue her, which was hours later. Thanks all, i would do everything i can, they are my world. vet came again today to dress leg, and even though she is now out all day, he is so pleased, not oozing anything and hasnt split or worsened, he says now there is no risk of infection, it has covered over more than above picture already, managed to save skin he stitched up and she was a real star even when he was cleaning and scraping gunk off.